We missed that type of movies where cities collapse and it's the end if the world. Although we know at the end of the movie the main actors will stay alive in a way or another, we always experience that kind of suspense throughout the movie. San Andreas will make you live 2 hours of adventurous ride with The Rock (Dwayne Johnson) trying to save his family and his marriage after a disastrous earthquake takes over California. The adrenaline in your body will remain high till the last second of the movie. Disaster movies does not relay on a complicated well written plot but on a survive race, passing from a complicated situation to a more complicated one until the heroes succeed and live happily ever after. 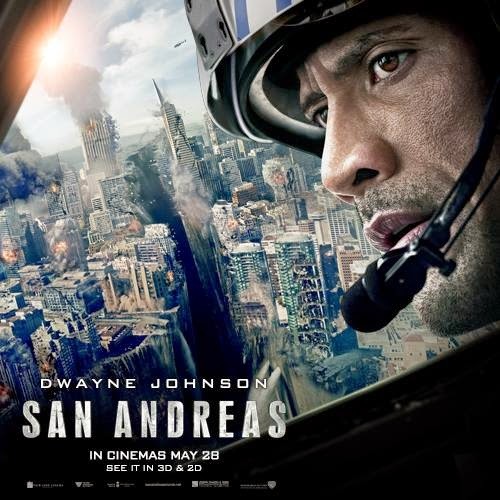 The bravory in these types of movies is in the acting skills, the direction, the photography, the special effect... San Andreas mix them all excellently, from true acting to great direction to superb photography and special effects. In San Andreas you will not only enjoy the beautiful San Francisco and how it falls down but also you will learn how to survive an earthquake.